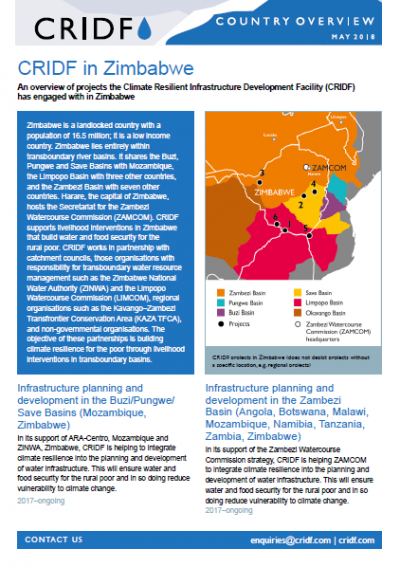 This brief gives an overview of projects CRIDF has engaged with in Zimbabwe, with particular focus on the impacts of the projects for basin communities. CRIDF works in partnership with catchment councils, those organisations with responsibility for transboundary water resource management such as the Zimbabwe National Water Authority (ZINWA) and the Limpopo Watercourse Commission (LIMCOM), regional organisations such as the Kavango–Zambezi Transfrontier Conservation Area (KAZA TFCA), and non-governmental organisations. The objective of these partnerships is building climate resilience for the poor through livelihood interventions in transboundary basins.